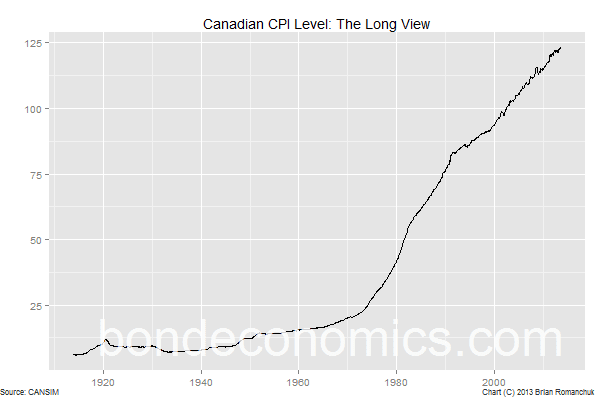 The chart above shows the long run history of the level of Canadian CPI; it has a lot of similarities to what happened in the United States (and similar countries). It is relatively easy to see the change of regime that started sometime in the 1960’s; the move from a relatively stable price level to a steady rise. 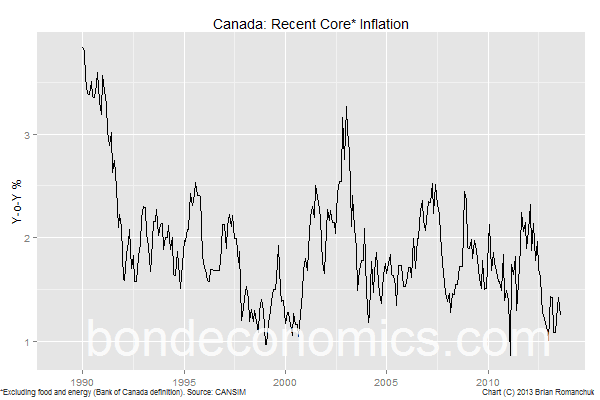 The chart below shows the latest regime Canada has entered into since the early 1990’s: a stable rate of inflation around 2% for core inflation (ex- energy and food prices). This period coincides with the Bank of Canada (BoC) have an inflation-targeting mandate, with the target at 2%. The Bank has hit its target throughout the period, for all intents in purposes. 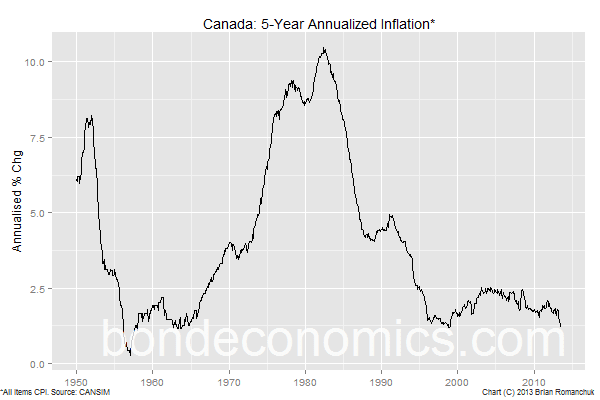 Even if we add in energy and food prices, inflation has been on target over the cycle: the annualised 5-year inflation rate has only varied from 1.2%-2.5% for periods ending from 1995-2013. This has meant that forecasting medium-term inflation has not been a particularly useful exercise for almost two decades. It was simpler, and probably more accurate, to take the BoC at its word, and plug in 2% as an inflation forecast. From the point of view of a bond investor, it has only been worthwhile worrying about modeling inflation more accurately if you traded short-term index-linked debt (under 5 year maturity). But in the case of Canada, such short-term instruments do not exist. If you are analysing 30-year Real Return Bonds, you need to forecast breakeven inflation (market expected inflation) for a long expectation horizon. Those expectations are driven by other forces than what will happen to the components of CPI over the next few months. Although it is clear that inflation forecasting ended up being a waste of time for the past two decades, is that true going forward? If you believe that inflation is essentially 100% under the control of the central bank, you can worry about a change of objective. If you instead think the BoC was lucky and hit its target by accident, you could then worry about whatever special factors held the inflation rate stable could evaporate. And one could easily have made a complacent forecast about inflation in the mid-1960s based on stable realised inflation, with disastrous results. I do not have a short answer, or even a long answer, to those questions. My instinct is that the low inflation is a structural phenomenon, and so it will not easily evaporate even if the BoC misses a few forecasts. Yes, the BoC inflation target is part of those structural factors, but it is not the only factor. The similarity of inflation outcomes since 1990 for most developed countries indicates that there are some other factors in play, aiding monetary policy. The real risk appears to be a structural changes to the policy mix: both monetary and fiscal policy. My reading is that there is no constituency for such a change, at present at least. All one can hope to do is monitor developments, and see whether the trends are shifting. And this is not just true for Canada; the same structural inflation stability is seen in the United States, Australia, and the United Kingdom (although the U.K. has had perkier inflation). Japan is a special case of having price level stability. In Conclusion: medium-term inflation forecasting is not a modeling exercise; instead it is an exercise of imagining what structural changes will allow inflation to take hold, and monitoring whether those developments are occurring. To what it extent it matters, I still would keep a medium-term inflation forecast unchanged at 2%.